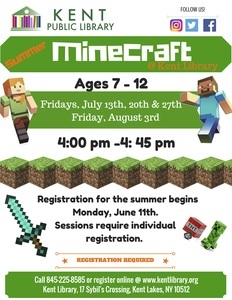 Ages 7-12 are invited to come and play Minecraft in our computer lab on select Friday afternoons at 4:00 during the summer: July 13, 20, & 27, and August 3. Did you know that the Kent Library has their own Minecraft server? Registration is required per session. The Kent Library is located 17 Sybils Crossing and can be reached at 225-8585 or www.kentlibrary.org.